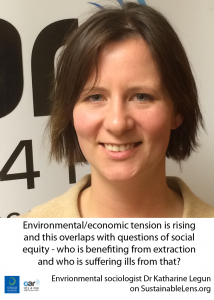 Dr Katharine Legun is an environmental sociologist in Otago University’s Department of Sociology, Gender and Social Work. She is interested in the relationship between the economy, social organization, and the environment. Stretched out commodity chains have separated the consumer from the environment. Food is an essential resource that goes beyond nutritional aspects – food politics is concerned with social security and your place in the world. Economy, environment and society are not actually separate, but separated in institutional practices. Shane’s number of the week: 2%. Global warming will cut crop harvests by 2% each decade (more>>>). Sam’s joined-up-thinking: Jon Kolko describes the empowering role of teaching entrepreneurial hustle – the idea that you can actively cause things to happen rather than passively have things happen to you (more>>>).